Creating Cotton Candy Hairstyle for Yourself, You can always spare time for your hair and make some mess with it. Every day, you see so many different hairstyles among women. Some of them are very formal, and some may be just for fashion. Well, talking about fashion, you can always tease your hair and by doing so, it will create fluff to make an assorted kind of hairstyle. Teasing your hair too much will definitely give your hair the feeling of having cotton candy on top of your head. But messing with your hair also means being prepared for a very long hair clean up because if you really want to have a cotton candy hairstyle, you will have to use a lot of hair spray to retain its form. 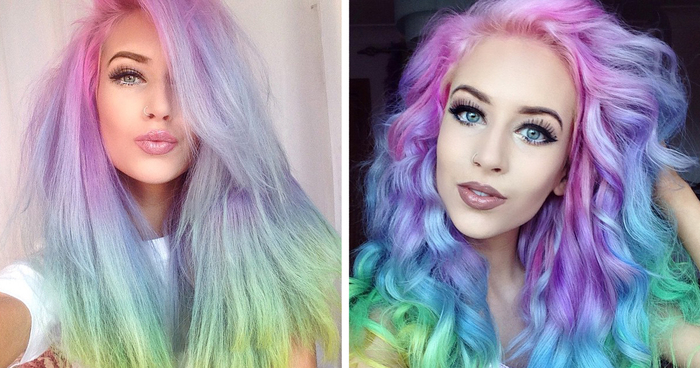 So how do you make a cotton candy hairstyle for yourself? For starters, you really have to carefully follow instructions. After mastering the procedure, that’s the time when you can put up variations on your hair get-up to look it more fashionable according to your preference. First of all, you should create small-sized section of your hair while putting up the remaining ones in a ponytail style. Hold on the loose part of your hair (the separated small section) up. Secondly, you spray light amount of hairspray on the underside of the loose section of your hair (the section you are holding up) and afterwards, you will immediately tug your hair using comb and perform quick and gentle downward brushes. During this stage, you will allow the comb to tug your loose hair out of your hand. For the third step, put small spurts of hairspray as you work on the remaining loose hair. After completing the first section, you will now then pull down another section of your hair and you are to repeat steps 1 and 2 until all the sections remaining on your hair gets all fluffy. Now for the last procedure, you will hold all of your fluffed up hair in a way that they will look cone-shaped. You will now use strong hairspray and spray your hair heavily at the same time apiece them all together. By using the heavy hairspray, it can help in retaining the form of your hair all throughout the day. As you can see, having cotton candy hairstyle is really hard to do. But you should always get prepared for cleaning your hair up after a long day. You should always keep your hair clean because putting too much additives on it can harm your hair and hair repair definitely costs a lot.